Turin is the only city (for now?) 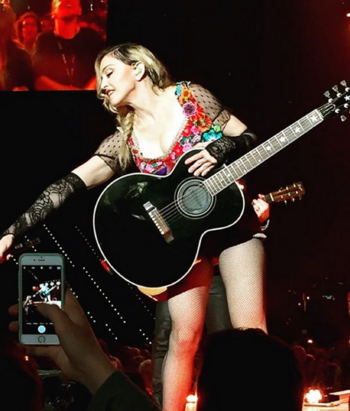 to host Madonna and her Rebel Heart Tour for 3 shows ! She avails the fact to be in Italy, the country of fashion, to thank many designers who made her outfits for this tour. That explains the reason why, after Dress You Up, she decided to take her dress off and perform the next 3 songs in "underwear". Among this 3 songs : Don't Tell Me, sang for the very first time on this tour ! Watch the video below. To notice: Extra security have been organized for the shows in Italy.